Is this the last blast of winter? Maybe….it seems like it’s all coming at once. But I do remember that in 2010 we had a freeze in April. Caution is the watch word for early spring gardening in North Texas. 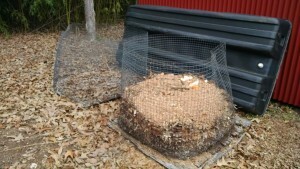 Be flexible, and be ready to haul out the covers for plants that were just placed in the ground. 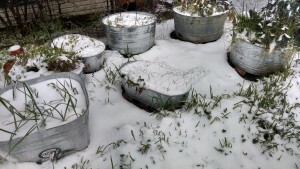 Looking at my garden tubs, I’m thankful I didn’t have enough time to plant collards, radishes and more lettuce just yet. 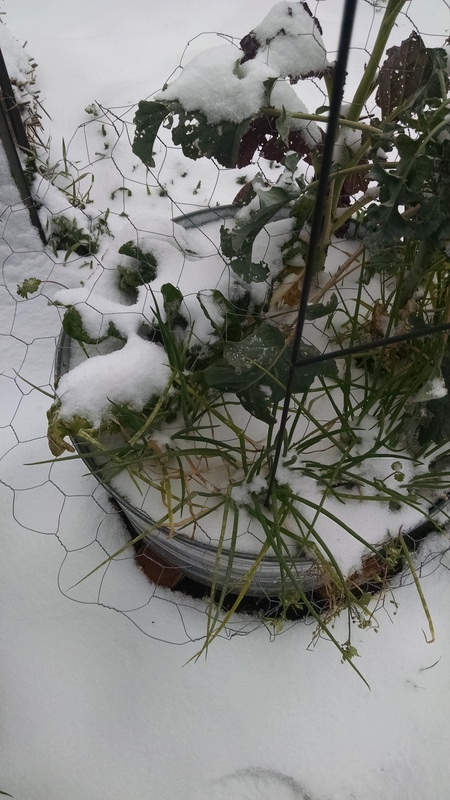 The garlic is also weathering the snow well. They’re in the square tub. I’ll check to see how the bulbs are forming when the snow melts. But look at the chard in the picture below (well, it’s hard to tell because it’s under all that snow! 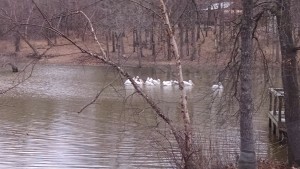 )…it’ll come back strong when it warms up a bit. Chard is durable and I’ve found it’s a perennial – hardy perennial. The downside, is that as it gets older and harvesting takes the outer leaves, the inner ones become smaller and smaller. But they are tender and tasty! Note that the green onions (those wisps at the front) are doing well, too. 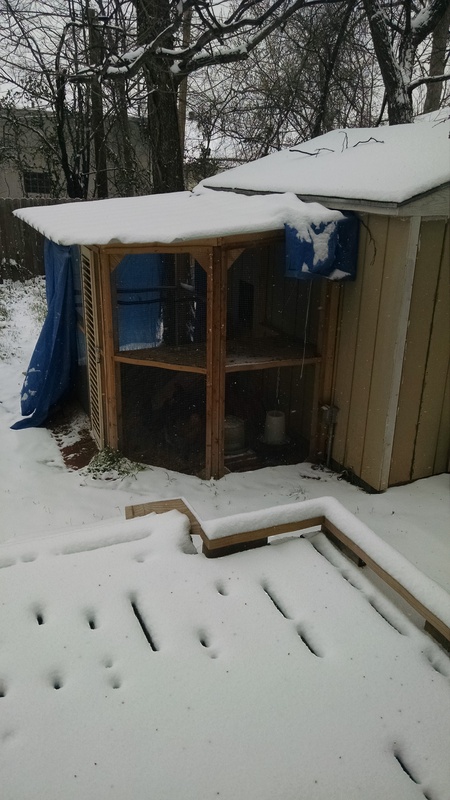 The chickens are well suited for the cold – they have feathers and down, and I’ve tarped the north and most of the west side of the run so that no snow gets into their habitat. I just keep them busy with scratch and some cracked corn (extra carbohydrate to help them keep warm). Next week will warm a bit. I’ll write more about what I’m planting next week – and if you’re in the Dallas Design District, stop by for my Straw Bale Gardening class at Trinity Haymarket (March 7, 10 am – free). 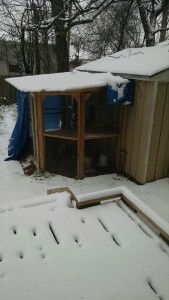 Posted in backyard chickens, chard, garden, gardening, snow. Due to weather, we’re postponing the Straw Bale Gardening Class until next Saturday (March 7). The weather is deteriorating, it’s not supposed to be above freezing today and freezing rain expected tomorrow. Not good for driving. We don’t want folks risking life and limb to attend the class. Stay warm and off the roads as much as possible. Gardening with children can be so rewarding. Not only can it be a time for quality interaction, but it can serve as a stepping stone to learning about a plant’s needs, bugs, weeds and patience. For instance, all plants need soil, water, nutrients (these are plant vitamins – like compost, worm poop, fertilizer), sun and temperature (cold season vs. warm season). Then there are the bugs – the bad ones that eat the plants or damage them, and the good ones that pollinate the plants or eat the bad bugs. In addition, the child learns what weeds are and why they take food away from the plant and must be removed. But not all “weeds” are bad – some, like dandelions, have deep roots and help bring nutrients from deep in the soil up so the other plants can use them. Weeds are just plants that are in the wrong place. In gardening, a child learns patience. My father once said, “You can hurry people, but you can’t hurry a plant.” And that is so true! There are some ways to speed things up a bit, but a seed is not going to sprout and grow to fruiting maturity in a week. Besides, it’s exciting to go out each day and see what how the plants have grown, and to watch as a tomato slowly ripens to picking maturity. 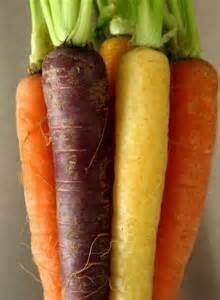 There’s even such a thing as a rainbow garden – there are so many vegetables that are available in colors. A child could help you pick out and plant seeds for purple or white carrots, black or pink tomatoes, blue or orange bell peppers, or even purple cauliflower. The garden doesn’t have to be all green – it can vibrate with color! Does your child’s school have a garden? 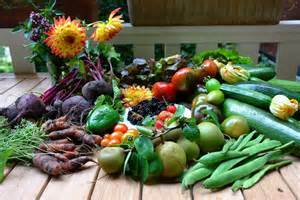 School gardens provide a wealth of learning and teaching opportunities. There are now a wealth of curricula available online for teachers (and parents) to access. 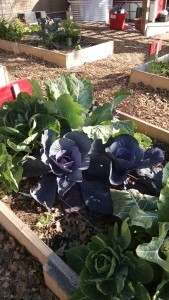 One site that comes readily to mind is www.edibleschoolyard.org . The Edible School Yard Project was started by Alice Waters (of Chez Panisse in Berkeley, California) a decade or so ago. I could get lost on the site, with all the lesson plans, searchable under a number of variables, and constantly being added by teachers under an open source program. 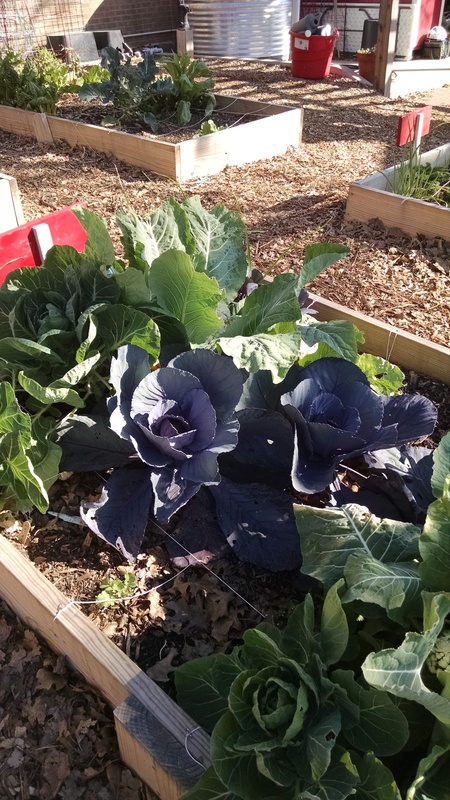 Here’s a look at one school garden I visited recently – the 3rd and 4th graders were harvesting broccoli and they had cabbage heading out beautifully. Another curriculum that is becoming available soon is from SlowFood USA (www.slowfoodusa.org ) The Slow Food National School Garden Program is developing curricula for elementary through high school. The curriculum can be accessed online as it becomes available. Further, some assistance for starting up and maintaining school gardens is available through a grant from Chipotle. Contact your local Slow Food chapter (www.slowfooddallas.com ) for more information – or you can email me (I’m working on the Garden Committee for SlowFood Dallas) at info@AnitasArbor.com . Posted in children, Edible School Yard, garden, gardening, SlowFood.